So far there has only been a few successful instant messengers that is still being used today. They are Windows Live Messenger, Yahoo Messenger, Skype and Google Talk. The good thing about Yahoo Messenger and Windows Live Messenger are they worked together in allowing the users to talk together without forcing them to use or install Windows Live Messenger if they want to talk to someone that is in the Microsoft Live network and vice versa. Windows Live Messenger has changed a lot over the years, removing some useful features and probably adding some unnecessary ones. Unhappy users can switch to using Yahoo Messenger where they can still talk to Microsoft Live users. Sometimes there is a need to simultaneously run multiple instances of Yahoo Messenger to protect your identify. One example is you are connected to Yahoo Messenger using your personal Yahoo account and you don’t want someone you’ve just met on the Internet to know your Yahoo address. What you can do is create a new Yahoo account and connect to Yahoo messenger with it but unfortunately by default you can only run one Yahoo Messenger at one time. 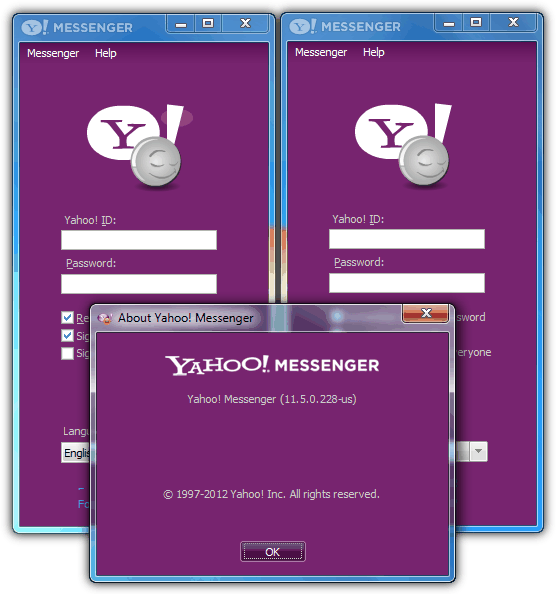 We are going to show you how you can run multiple Yahoo Messenger simultaneously. Running multiple instances of Yahoo is also commonly being referred as enabling polygamy. There used to be many third party tools to patch the Yahoo Messenger installed on your computer so you can run as many processes as you wish. However, the patching method is a bit risky because it involves modifying the Yahoo Messenger’s executable file which could result in the program crashing. Moreover, a patcher mostly can only work on the particular version and if you are using a different version, then it will not work. Oddly Yahoo seems to have created a hidden universal method that works on all versions of Yahoo Messenger including the current v11 to safely allow running multiple Yahoo Messenger without modifying the program. All you need to do is add a “Plural” registry key in Windows and it takes effect instantly without requiring a reboot. For your convenience, we have created the registry file which you can just run it to get it to work. Click the Yes button on the confirmation popup window. Do take note that this registry key trick works only for the currently logged in user. If there is another user on the same computer, he/she will also need to run the registry file to be able to launch multiple Yahoo Messenger. Just add a DWORD (32-bit) registry key with the name “Plural” and value data as 1 to enable, 0 to disable. Removing the Plural DWORD key will also disable the polygamy for Yahoo Messenger. Thanks. It works well. Is there a way to download two different versions of Yahoo Messenger on the same computer? I am a fan of Yahoo Messenger 10 but I’d also like the latest version at the same time. Is there a ploy to do so?